Janggi, also written as Changgi or Jangki or Tjyang Keui, is Korean Chess, Chess played in Korea. It presents many likenesses with Chinese Xiangqi and there is no doubt that both are closely related. The first Janggi association has been founded in 1956. 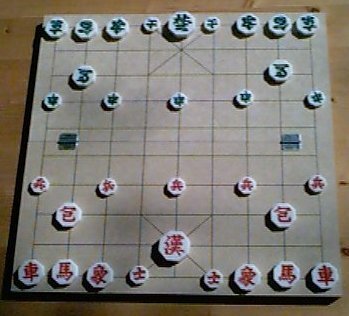 Janggi is played on the intersections of a 9x10 board. Each camp has a "palace" which is constituted by 3x3 intersection at the center of South and North sides. The armies are formed by 16 men each. The red pieces bear their name written with a Chinese ideogram while the black ones have a cursive lettering. 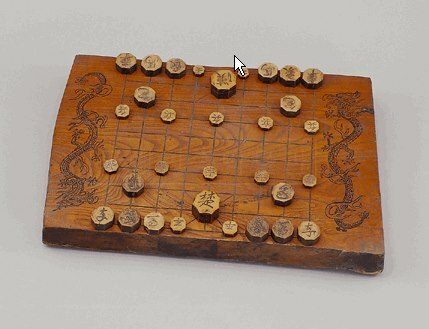 The board has 9x10 intersections without a separating river as in the Chinese game. 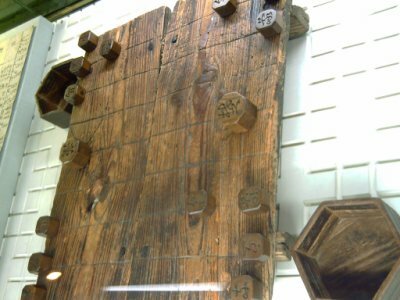 The pieces are often tokens with an octagonal form. They come in 3 sizes : the largest is the General, the smallest are the Guards and the Soldiers and all others have a medium size. Before the game starts, the players have the possibility of switching Horse and Elephant on one or both of their aisles. The General is placed in the center of the 3x3 palace, therefore on the second row. The General moves within the palace, 1 step in every marked directions, including diagonals. (Same move than FIDE King when the line is effectively marked). The Guards are exactly moving like the General. The Elephant is very specific. It moves 1 step orthogonally then 2 steps away diagonally (as an elongated Horse step). All intermediate intersections must be free. It can go everywhere all over the board since there is no river to restrict its move. The Soldier can move and take 1 step beside as well as 1 step forward since the beginning of the game. Then, there is no promotion possible. This also is a consequence of the absence of river. The Cannon must jump over a piece to move as well as to capture. It cannot jump over an other Cannon, it can not capture an other Cannon neither. As a consequence, it is not possible to start the game by moving a Cannon. Within the palace, Chariot, Cannon and Soldier are allowed to move along the marked diagonals. 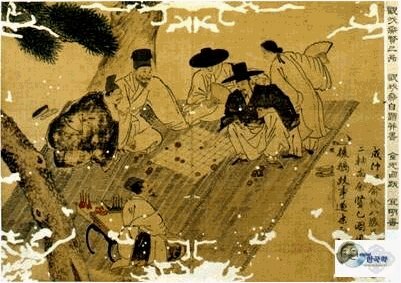 The first known mention of Janggi in Korea is due to Jang Yu (1587-1638) (Chang Yu). At this late time, the game was already identical to the one played today. Therefore, the history of Janggi is still to be written. The very first author who made Janggi known to westerners has been Stewart Culin in 1895. His book has been reprinted and is highly recommendable for those who love board games with very precious observations. 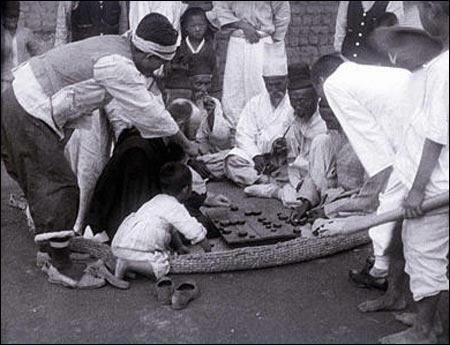 (Culin, Steward, 1991 reprint of an 1895 original: "Korean Games. With Notes on the Corresponding Games of China & Japan". Dover Press. ISBN 0-486-26593-5.). The oldest known janggi pieces have been found in a shipwreck (known as Mado shipwreck N°3) which sunk at the end of the Goryeo period, between 1265 and 1268, in the waters of Mado (Taean county, South Korea) en route to Ganghwado, the temporary capital at the time. They simply consist in mere pebbles with rounded edges and Chinese characters painted with ink on one face. They are conserved at the National Research Institute of Maritime Cultural Heritage, Jeonnam, Republic of Korea. Janggi stones found in Mado Shipwreck N°3. See more here. 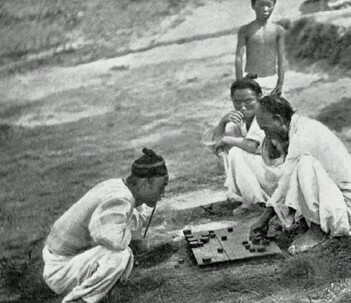 Without any doubt, Janggi can be considered as a Xiangqi variant. 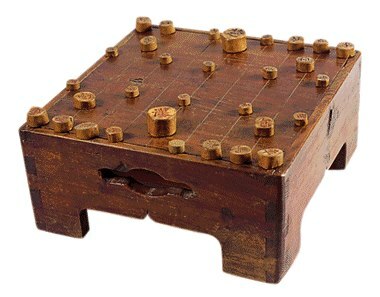 The most probable is that Janggi evolved from Xiangqi. (The opposite is less probable : it is difficult to believe that the Janggi board would have been the primitive one, and that a river had been added latter on somewhere and then generalized to all China). Without the river, there were no reason to forbid the Elephant to go on the other side. With the Chinese move - 2 steps diagonally - this piece could only get to 12 intersections, none of them common to both players. This is probably the reason that motivated the change : the Korean Elephant can land on every intersections on the board. General and Guards, confined in their palace, have got an increased power. 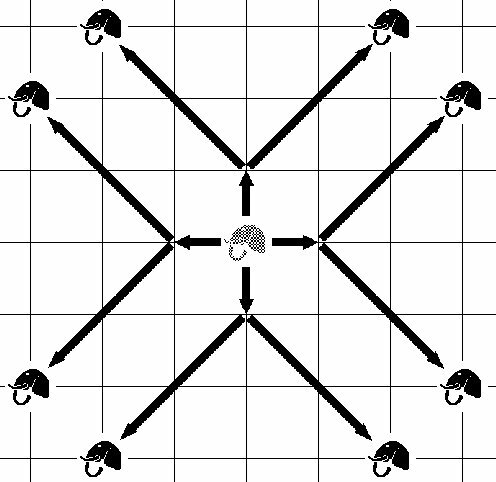 In Janggi, the General can move diagonally and the Guards can move orthogonally - on marked lines only. Consequently, both present the same move there. Again, it is difficult to imagine an evolution towards Xiangqi leading to different moves. Moreover the Chinese move of the Guard is the same than the Vizir in Persia / India. 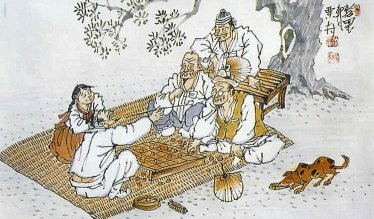 Definitely, Korean Chess seems younger than the Chinese one. Surprisingly, the Korean Cannon has a restricted move: it has to jump to move as well as to capture). What is the rationale for that ? It could be a desire of logic : making move equal to capture for all pieces. Or, it could be that both Chess separated when the Cannon's move was still in its youth. It can not be excluded that the primitive move of Cannon was different from what it is today in Xiangqi or Janggi anyway. The Korean Cannon is an interesting case.